Most investors would be happy if their investments did just that over the years. But imagine if a single decision caused your multibillion-dollar investment to double in value basically in the blink of an eye. It sounds too good to be true. But it may have just happened to some of America's richest people. And it's all because the Supreme Court just made history. In short, the Supreme Court struck down a 26-year-old federal law in May. This law had barred single-game gambling in the United States, except Nevada. Just to be clear, the Supreme Court didn't legalize gambling outright. Instead, it will allow each state the power to license, regulate, and tax the sports-betting industry within its borders. I think everyone who owns a top-four professional sports team just basically saw the value of their team double. Cuban, as you may know, is a billionaire businessman. He also owns the NBA's Dallas Mavericks. But here's the thing. You don't have to be mega-wealthy like Cuban to cash in on this. Everyday investors can turn this historic decision into profits, too. This announcement will change the way people watch sports. Last week, at Casey Research's Florida headquarters, Strategic Investor newsletter editor E.B. Tucker told me why this is. Sports teams stand to make a killing from this. That's because gambling increases people's interest in watching sports games. Now, this is somewhat anecdotal. But we've all heard people talk about putting $50 on the home team. You go to a tailgating party for a college sports team and everybody's saying we'll put $20 or $50 on the home team. So, betting increases people's attention span and desire to be at the game. It encourages people to participate in the fan experience. And that's good for ticket sales and TV ratings. This historic ruling will also – obviously – encourage more people to gamble. Just put yourself in the shoes of the average sports fan. You'd obviously be much more likely to place small, legal bets at your local stadium than make bets illegally with a bookie who might break your kneecaps. Today, most sports betting happens on the black market. In fact, the American Gaming Association estimates that the illegal market for sports betting brings in $150 billion every year. That puts it on par with United Nations estimates for the global marijuana industry. But even that might be lowballing the market's size. In fact, Bank of America Merrill Lynch says the illegal market for sports betting is worth $200 billion. Meanwhile, the research firm Eilers & Krejcik Gaming estimates that the legal sports-betting market in the U.S. was worth around $270 million last year. That means the legal market for sports betting would become 37 times bigger if legitimate businesses captured just 5% of the underground market. That isn't just realistic... it's likely to happen soon. Delaware just legalized single-game sports betting. It did this just three weeks after the U.S. Supreme Court struck down the controversial federal law. It became the second state after Nevada to take single-game sports bets. A week later, New Jersey became the third. But it's only a matter of time before other states follow suit. After all, four other states – Mississippi, Pennsylvania, West Virginia, and New York – are working out rules to get sports gambling operations up and running. In some cases, they've already started. Bank of America Merrill Lynch thinks so, too. In fact, it thinks that gambling industry revenues could reach as high as $10 billion by 2023. Opportunities like this do not come around often. So consider speculating on casino and gambling stocks if you haven't yet. You can easily do so by buying the VanEck Vectors Gaming Fund (BJK). This fund invests in 43 casino and gaming stocks. That makes it a relatively safe way to bet on this megatrend. Editor's note: On February 4, 2019, more than $4 billion will flow into the sports-betting industry – all thanks to this historic ruling. And E.B. Tucker believes three stocks in particular are positioned for the biggest gains. He says investors who get in ahead of time could make three, five, or even 10 times their money... Get the details here. "This technology is quickly becoming a reality," Jeff Brown says. "And it could soon be part of our day-to-day lives." Right now, another corner of the market is also poised for big gains. Read more here: This Tech Will Kill the iPhone. "This event was big news," Steve writes. "But no one cared. No one was paying attention." As he explains, another massive change is taking place in the markets. And this big shift could lead to a once-in-a-lifetime opportunity for investors... Learn more here. 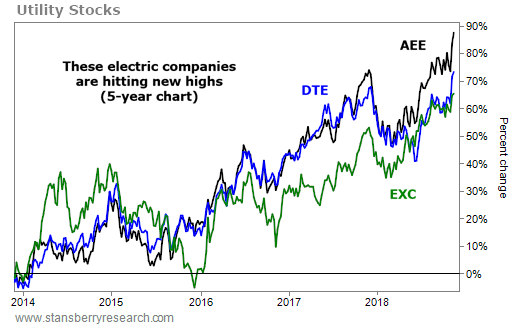 For proof, we’ll look at shares of three electric companies: Ameren (AEE), DTE Energy (DTE), and Exelon (EXC). Each of these companies is headquartered in the Midwest. And each provides millions of people across the country with electricity and natural gas. This in-demand service ensures steady profits… Each company reported higher earnings per share in the third quarter compared with this time last year. What’s more, all three companies have consistently paid dividends and raised their payouts for years.